TED has never been more necessary than it is today. It provides a place for robust conversation about the way we live, now and into the future, at the very moment when we must, out of necessity and desire, begin to dream up and make a better world. The conversation at TED is about many things. It’s about technology and entertainment and design, about business and science, about global issues and so much more. But at heart, TED is about the endeavor of human understanding. It’s about the long march of humanity, out of the darkness and into the light. It’s about the notion that ideas matter, that ideas and the stories we wrap them in have the power to change the world. 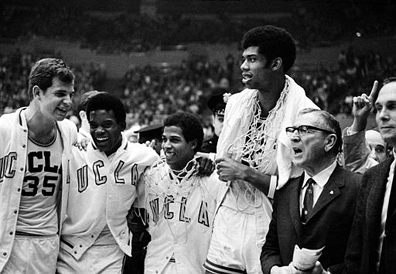 One of my favorite TED Talks of all times is the one given by the late and legendary John Wooden, the UCLA men’s basketball coach who mentored such giants of the game as Bill Walton and Kareem Abdul-Jabar. Wooden was inducted into the Basketball Hall of Fame (he was the first person to be inducted as both a player and a coach), and named the greatest coach of all time across all sports by ESPN. Wooden’s great achievement, however, was not in shaping athletes (or not only in shaping athletes), but in shaping the minds of men. It is his great legacy, his singular achievement, the measure of who he was as a man. To watch Wooden’s TED Talk on the difference between winning and succeeding is to gain a new understanding of the true value of a human life. It should be required viewing — for our children, and for ourselves.